The Rothschild family, secret rulers of Israel, for their part, told the White Dragon Society “We want to mend our ways.” They promise to reach an agreement on setting up and financing a new future planning agency during meetings due to take place in July, according to WDS sources. The Rothschilds responded by saying Nathaniel Rothschild recently lost a $300 million lawsuit, a first ever loss for that family. Furthermore, the French head of the family, Baron David de Rothschild, is on the run from the French police after an indictment for fraud, In other words, they know they are no longer above the law. They also want to find a new protector for their colony of brainwashed slaves known as Israel. That is why Benyamin Netanyahu has gone four times to Russia recently to seek Russian protection from expected Pentagon law enforcement actions against their country. The Russian government, however, is now run by the Orthodox Church and the old Tsarist Nationalist network and is in no mood to protect the people who caused their nation so much torment during the 20th century. The WDS will only protect the innocent among the Jews and will insist on their re-education based on their true history and applying the golden rule (do unto others as you would have others do unto you) to all peoples and not just Jews. The black nobility, for its part, is fighting desperately to keep their EU fascist government intact. They staged a killing (real or fake is not clear) of pro-EU politician Jo Cox to try to manipulate public opinion towards staying or at least create a plausible cover story for a planned vote stealing of the Brexit referendum due on June 23rd. WDS and Illuminati sources have both previously corresponded with Jo Cox when she was identifying herself as a Rothschild agent. If the British people vote to regain their independence, it will be a huge blow to the black nobility. Even if they don’t, the European banking system is in a state of collapse which will undo their fascist EU project anyway. In any case, the WDS will only respect action, not promises, by the “R&R,” and their black nobility bosses. If they steal or try to steal the British referendum, there will be consequences. Speaking about R&R, a CIA source says he recently saw Richard Rockefeller alive and well in Argentina. Rockefeller supposedly died in a plane crash in 2014 so, if this source is right, he just faked his death so he could escape from the US. Pentagon sources say he is the exception and most top Khazarian mafia bosses still in the US will not be allowed to escape justice. A separate senior Rothschild source told a WDS member in Europe that their family would come through the current troubles intact “after making some adjustments” but that the Bush and Rockefeller factions were in much deeper trouble because of their association with the genocidal New World Order plan. A senior Chinese government source affiliated with the Shanghai faction says his understanding of the districts is that the current 5 permanent members of the UN security council; China, France, Russia, the UK and the US, will be replaced by representatives from 7 regional groupings: Africa, Asia outside of China, China, India, Europe including Russia, the Muslim world and North plus South America. Decisions will be made by a majority and each region will only have a veto valid for its own region. Australians will have a vote to decide which region they wish to join. Existing nation states will continue with strong autonomy within their regions. The aim of this plan is to permanently end war on this planet and thus allow for the quarantine on the planet earth to be ended, sources who claim deep connections to the “secret space program” say. Pentagon sources confirm the recent Paris Climate Change Accord which has been ratified by France, the BRICS nations and “soon” the US is a disguised gold and asset backed currency framework and global currency reset. In this new system the percentage of emissions will be seen as equal to the percentage of world GDP, so China would have 20% control of the global currency in this system, the sources say. This new system has a huge advantage over what has prevailed until now in that natural ecosystems will have value in and of themselves and so will be protected as never before. For example, a rain forest would have huge value as a carbon sink and so cutting it down would become prohibitively expensive. This appears to be good news. However, the battle for the planet earth is still not over and we must all keep fighting until it truly is. For example, a group in Europe contacted the WDS to say they are planning to stage some huge incident at 15:30 Central European Summer Time on June 21st, the day of the summer solstice and a traditional time of sacrifice by fire. The sources would not be any more specific about what they plan. However, sources in the European black nobility have previously told this writer they plan big geopolitical events linked to the movements of the planets. Since this solstice coincides with a full moon, they could very well have something big up their sleeves. The gnostic illuminati, for their part, are admitting their ISIS campaign has failed but say the remaining ISIS fighters will struggle to the last. They also say they still might nuke one city but would not say which one. It is likely any such attempt will be neutralized, they were warned. We are also getting more X files type of information sent our way. Years ago Paul Laine of Pentagon military intelligence told this writer of a secret Nazi submarine base in Indonesia. 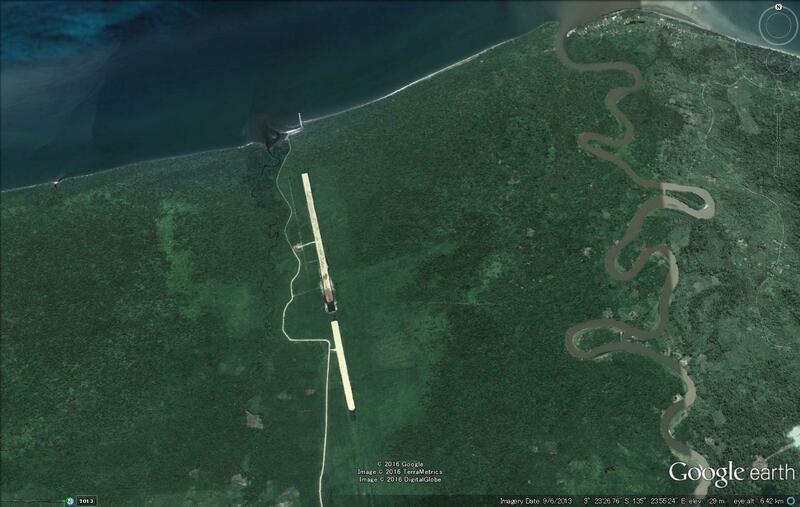 Now a CIA source in Indonesia confirmed such a base does exist and can be found in Nabire, Indonesia. The submarines are busy transporting gold for use in the new financial system, he said. 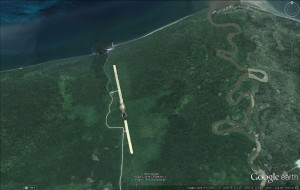 A Google earth screen-shot of what appears to be the base can be seen below. This is crazy sounding stuff but some corroborating evidence is available. Korean government officials have previously told this writer that no bodies were found in the ferry disaster of 2014 there where over 300 secondary school students supposedly died. Nor have we been able to locate photographs of bodies from that incident. A member of the non-genocidal part of the Nazi faction of the cabal said the students were needed to counter-act the effects of too much “Aryan” inbreeding. I have also previously confirmed that children in the US vanish at a 20 times greater rate than in Japan. Certainly nobody seems to know what happens to most of the children taken away by the authorities in the US. The other X-file information is that this writer, while driving his car and listening to US Armed Forces Radio in Tokyo, heard recruiting advertisements for the “US Space Command.” The ads said serving in the command would be “similar to serving in a ship.” The disclosure and secret space program folk keep saying some big event is coming soon. Hopefully soon we will find out the truth. Here on the planet earth we are working hard to make it happen without waiting for the sky to open and giant spaceships to come and save us. That is why we are concentrating on following the forensic trail to locate the sources of our problems. We are now dealing with the sources.